Dispose flammable liquids safely. 6" long brass vent with flame arrestor and screen included. Cover is hinged, lockable and has a fusible link that melts at 165°F, automatically closing the cover. Fits standard 2" NPT bung openings. FM-approved. IN STOCK. Pour liquids from cans, filters, and pails safely and easily. Poly funnels fit all 55- and 30-gal. closed-head drums and most 5-gal. pails. 18" dia. funnel allows access of 3/4" bung. 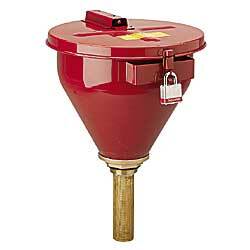 Funnel spout fits any 2" NPT bung. Optional cover prevents content contamination. IN STOCK. YP-0060 5	 6-1/2	 C	 6"H side-wall funnel	 18" x 7"
YP-0061 5	 6-1/2	 C	 Side-wall funnel with screen	 18" x 7"
YP-0352 2	 4	 D	 Low-profile funnel	 21" x 2"